In a tall pot, about 30 cm high, with half a cup of water and sugar, make a blond caramel (125 °C). Add the cream and cook until dissolved. Over low heat for 10 minutes. Spread between the 4 jars and freeze for 2 hours. In a saucepan bring the cream, sugar and vanilla to a boil. Put this hot preparation on the yolks, beating constantly. 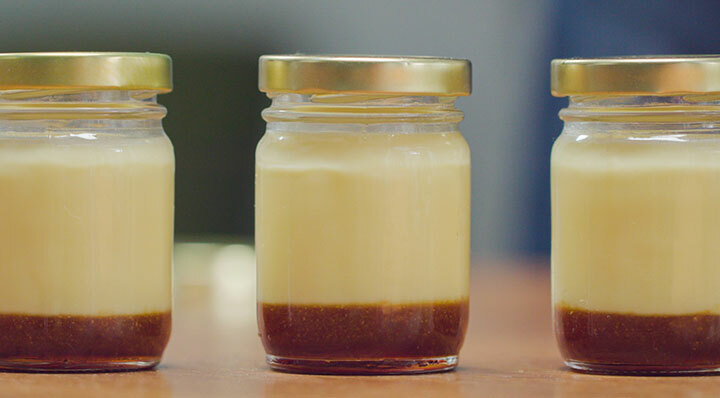 Strain fine and distribute between the 4 jars on the frozen Toffee sauce. Tape well and cook sous vide in fusionchef water bath at 85 °C for 1 hour. Let it cool and consume up to 3 days after its. preparation. This recipe was kindly provided by Ricardo Maffeo.